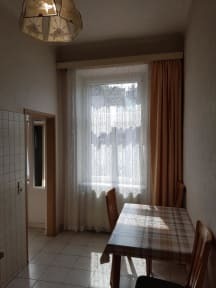 Sehr großes Zimmer mit Sofa, Esstisch, tv und nebenan eine kleine Küche mit Herd und Kühlschrank,Wasserkocher, Töpfen, Geschirr, Kaffeemaschine. Super Bad mit wunderbarem Wasserdruck in der Dusche/Badewanne. In 5min Max. Ist man bei der Tram. Westbahnhof umsteigen in die U-Bahn und man ist in 20min in der Innenstadt. Public transport super da U-Bahn alle 5 min kommt! Alles top, keine Probleme, sehr gern wieder. Ah ja einziger Haken, Betten etwas durchlegen/ zu weich. Old fashioned apartment with old furniture, granny style. 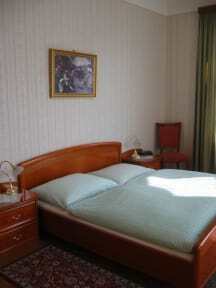 It was very clean and the bed very fluffy and comfortable. The Location is fine, it’s very close to a bigger station and the shopping streets. Vienna is a pricy city so I would say it’s an okay price since you get a whole apartment without noisy neighbors for yourself. Staff is only one guy living unter same building who is willing to help with anything requested like e.g. an umbrella.